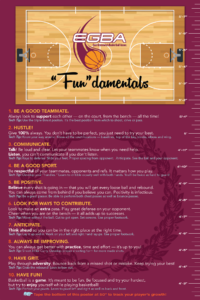 Back in March I shared my experience introducing our Fundamentals System (our proprietary process to intentionally drive a high performing culture) to my daughter’s youth basketball team. Further, I mentioned that the process was so well-received that the entire league, The East Greenwich Basketball Association (EGBA), decided to implement the process league-wide. For those that might not have seen the original article, here’s a link. We received so much feedback on that post, that I thought it would be worth sharing what’s happened since. Since that first article, we’ve made a number of refinements. We consulted with major college coaches along with our local high school coaches to determine which specific skills (character and basketball) are most critical for the kids in our program to learn. In addition to focusing on a “character-based” Fundamental each week, we’re now also focusing on a technical basketball skill. For example, in week one we’ll be focused on the importance of Teamwork. Concurrently, we’ll be teaching the “triple threat” position. Now those players who are lucky enough to play in high school or beyond will be incredibly well-prepared. More importantly, every single one of the kids will benefit from the life skills we’re teaching them. Skills such as grit, teamwork, and attitude will pay dividends long after the kids hang up their basketball shoes. We’ll be working with all coaches and parents all season long, keeping them involved in the teaching of our Fundamentals each week. The process will be kicked off at our pre-season coaches meeting. At this meeting, we’ll introduce the coaches to the Fundamentals and help prepare them to effectively teach their players. We’ll also be distributing this poster (click poster image) to every participant in the league. The poster is a daily reminder of the weekly Fundamentals. Through the combination of communication, practice, reinforcement and repetition, these skills will simply become part of the players’ DNA. It’s fascinating to see that the same process that’s been so effective with our corporate clients can work just as powerfully with our children. Whether it’s youth athletes, professional athletes, musicians, or our employees, if we can articulate the specific behaviors that drive success, and we can create a systematic way to teach them over and over again, they’ll become ingrained. That’s the power of being intentional. If you’d like to learn more about driving success through your organization, just give us a call or shoot us an email.